EDITOR’S NOTE: The screen shots below show that Rodney Blackburn ends his “Unison Wealth” promo at the 8:29 mark of a 14:27 video. At the 8:30 mark, the website of the SEC becomes the feature and remains so for nearly the next six minutes as Blackburn touts Achieve Community, Unison Wealth and Trinity Lines, Ponzi-board “programs” one and all. It is Saturday. The PP Blog did not immediately hear back from the SEC on a request for comment. 1. From ‘Unison Wealth’ . . .
“We’re leaving the markets of these crazy MLM companies, and there are people like the Achieve Community, Trinity Lines, Unison Wealth, many of these other companies are coming out. And they are making programs that are very simplistic, they’re passive, they’re residual incomes. They’re just so simple you just kind of put your money down.” — Rodney Blackburn, Jan. 9, 2015. 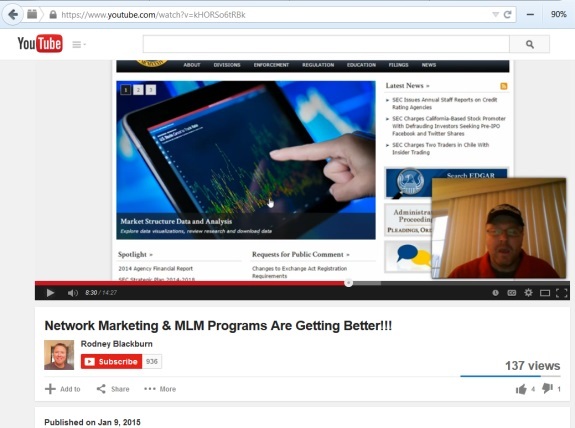 A 14:27 YouTube video from an “Achieve Community” member now promoting at least two other Ponzi-board schemes includes nearly six minutes of continuous footage from the website of the U.S. Securities and Exchange Commission. The latest promo by Rodney Blackburn focuses on “Unison Wealth” and has a publication date of Jan. 9, 2015. 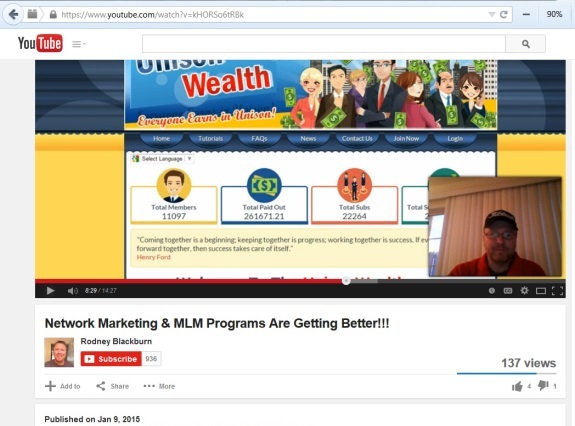 It is titled “Network Marketing & MLM Programs Are Getting Better!! !” The promo suggests that ordinary MLM creates an environment in which 97 percent of participants lose and that new, smarter, better schemes are emerging to replace them. In short, Blackburn says, in the new way of network marketing, participants “just kind of put [their] money down” and payouts flow back to them. What’s more, he implies, the SEC doesn’t have jurisdiction, despite mountains of evidence to the contrary, including several concurrent active prosecutions involving network-marketing or MLM schemes with passive components. Blackburn even dares individuals to complain to the SEC about the “programs” he’s promoting. Blackburn proceeds to click on an “ABOUT” tab and a “What We Do” subtab at the SEC website. He then cherry-picks a quote from the agency’s site, wholly ignoring sections on SEC enforcement that detail various cases brought against network-marketing or MLM schemes. “The mission of the U.S. Securities and Exchange Commission is to protect investors, maintain fair, orderly, and efficient markets,” Blackburn says, reading from the SEC site. That’s true, of course — but the cherry-picking ignores the much larger whole. Had Blackburn simply typed “MLM” into the search box in the upper-right corner of the SEC site, he’d have gained instant access to information that undermines his jurisdiction theory. Without perusing the enforcement section that has information on recent schemes such as Zeek Rewards, TelexFree, WCM777, eAdGear, Zhunrize, CKB168 and others, Blackburn switches back to his personal narrative. Even as Blackburn tries to make the case that the “programs” are outside the purview of the SEC, he tells his audience that he prefers “passive” programs.” Somehow lost by Blackburn in all of this is that the passivity of a scheme and how it behaves in practice are what confer jurisdiction on the SEC. This has been the law in the United States since at least 1946. Kenneth D. Bell, the receiver, is suing thousands of individuals for the return of hundreds of millions of dollars, saying their “winnings” came from hundreds of thousands of victims defrauded by Zeek. It is the act of “an absolute buffoon” to “not take your money and put some of it back in” Achieve. “Decline comment” indicates that the SEC is very much aware and involved in the investigation of the Achieve Community. There actually is a medical questionnaire targeted at military personnel. It appears to be hosted on an insecure site and asks intensely personal questions. Plus, it collects SSNs, DLNs, DOBs and Military ID numbers. Knock me over with a feather. Did anyone know that Rodney, in Dinar Guru forums once was very well known as “GanKan” the G in the GET Team of lying dinar gurus? I didn’t and just found out, and it makes me VERY interested in the Assistant Manager of the local Bob Evans. Imagine that, between gathering high level intel from the Central Bank of Iraq, IMF, US Treasury and other confidential sources, he was taking carryout orders and helping the servers get orders ready and washing the dishes. I am curious if Ms. LaGarde was put off when she called to let Rodney know what the IMF was up to on a given day and his secretary answered the phone by asking if she was interested in the Biscuit and Gravy Special? Gregg Evans: Rodney, in Dinar Guru forums once was very well known as “GanKan” the G in the GET Team of lying dinar gurus? Charming how so many of these know-it-all promoters just evaporate into thin air once enough of their SCAMS turn into dust. Wasn’t Rodney Blackburn also “going big” in the promotion of the UFun/UToken SCAM? shipdit: Wasn’t Rodney Blackburn also “going big” in the promotion of the UFun/UToken SCAM?